Pula is a small town and it’s likely you’ll be able to walk to the Pula Arena from your hotel. Furthermore, hotels in Pula are good value. 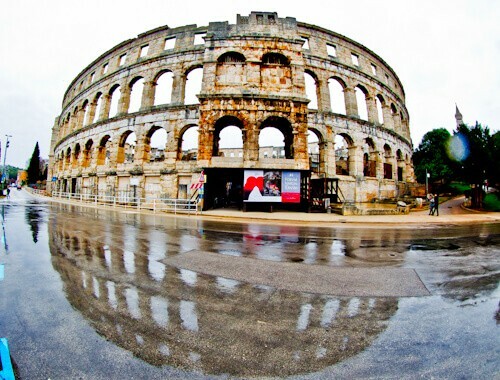 Pula Arena is conveniently located on the edge of the historic center of Pula. As a result, wherever you’re staying in the city it’s likely you’ll be able to walk to the arena. When I was walking from the Flixbus stop my accommodation in the historic center I walked right in front of the Roman amphitheater. When entering the city it’s a stunning site to see. 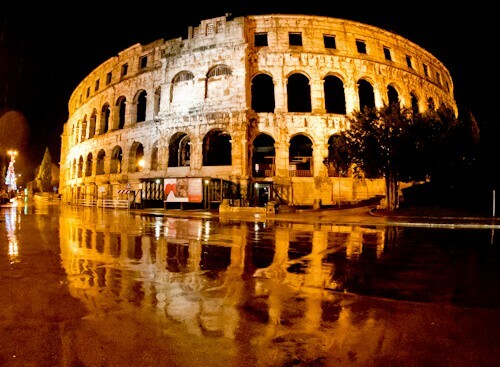 Arena Pula was constructed around the same time as the Colosseum in Rome. In fact, it was constructed in the first century under the reign of Roman Emperor Vespasian. 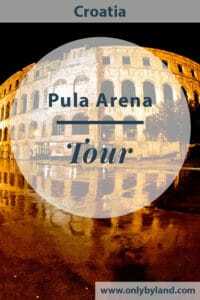 Pula Arena is oval shaped, 130 meters in length and 100 meters in width. It’s one of the largest surviving Roman amphitheaters of the world. The amphitheater is build on a slope, thus the lower half has 3 stories and the top half only 2. 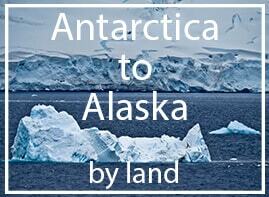 In addition, there are a series of underground tunnels from which animals could be released into the arena. This arena was part of the main Gladiator circuit just as the Stade Louis II in Monaco is part of the Diamond League circuit today. The Arena has 4 towers. Each tower had 2 water tanks on top filled with perfumed water. This water was the source of a fountain and could also be sprayed over spectators. 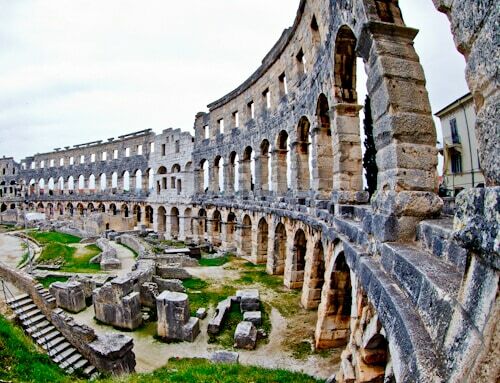 Furthermore, Pula Arena is the oldest ancient monument in Croatia. Gladiator fights would take place in the Arena. In fact, arena is the Latin word for sand. Romans would cover the battleground in sand to absorb the blood of the wounded or killed. Additionally, the modern English word arena came from this practice by the Romans. The capacity of the arena in the first century was over 22,000 spectators. However, today the capacity is between 7000 to 12,000 spectators. Whilst waiting for the next Gladiator battle, Romans could enjoy a view of the Adriatic Sea. There are 72 arches on each of the first 2 levels. On the top level there are 64 rectangular window shapes. Consequently, the Romans knew how to enjoy a good view! 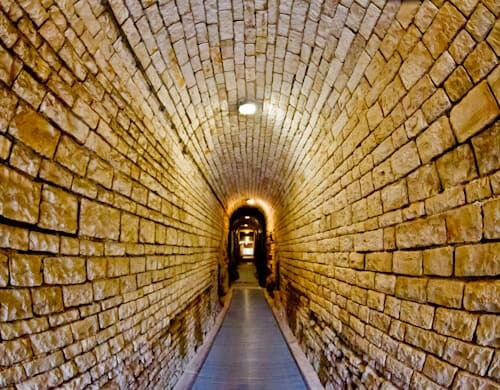 To access the Pula underground you must walk through a narrow tunnel. This is where beasts were kept before battle. Imagine all the history and killing which went on in the underground tunnels of the amphitheater. Consequently, the beasts and gladiators which were killed during battle were dragged through these tunnels. As a result of the bloody history you may have a ghostly experience in the underground tunnels. There are several underground tunnels which lead to the subterranean gallery. Directly below the center of the arena is the main underground, known as the subterranean gallery. It was carved out from solid rock and is directly below where battles were executed. 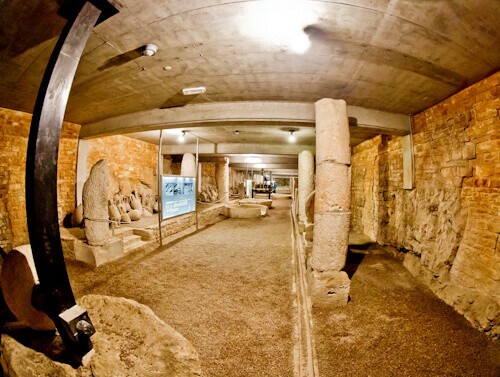 After battle, killed or wounded beasts and gladiators were put on show in the subterranean gallery. 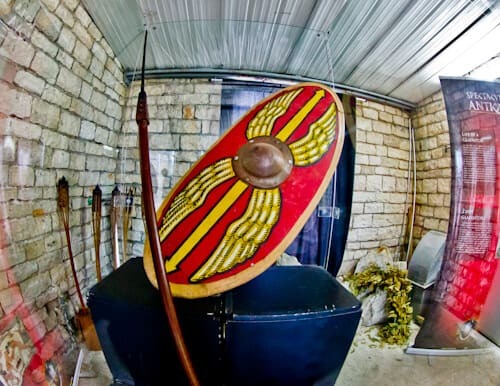 In the arena you’ll find a room full of real Gladiator clothing and equipment. 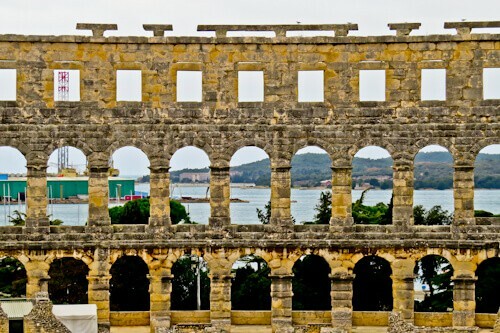 Once a week during the summer months Pula Arena hosts simulated Gladiator fights. This is as close as you’ll get today to see how it was back in the day. As a result, you’ll experience a real life Gladiator movie experience. The event is called Spectacvla Antiqva (in Croatian). The Roman Amphitheater still hosts major events today. Pula tourist information page has information on the latest events. Furthermore, there is the world renowned annual Pula Film Festival held at the arena. In addition, world class acts perform concerts at Pula Arena. To demonstrate, famous stars such as Luciano Pavarotti, Sting, Elton John, Grace Jones as well as Tom Jones have all performed concerts here. Pula Arena closes in the evening. It’s still worth visiting when it’s closed. At night the arena is lit up. You can take some wonderful night shots of it. If you are lucky (or unlucky!) it will be raining and you’ll be able to make a reflection shot (above). As Pula is a lot quieter than Rome it’s likely you can photograph Pula Arena without people in the photo. 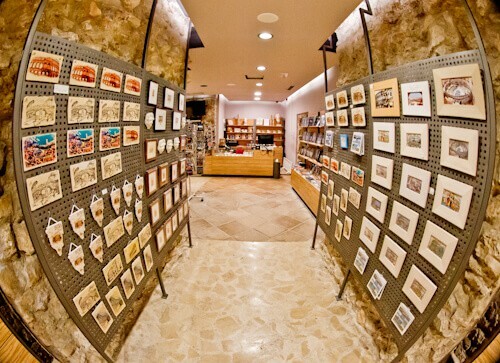 After your visit to the Pula Arena, you will pass through the gift store. There are lots of souvenirs available in here from fridge magnets to Roman clothing. If you’re into Roman history, there are some interesting books on this subject. In addition, there are photo books available showcasing Pula Arena. Enjoy your visit to one of the best preserved Roman Amphitheaters in the world. Most importantly, make sure you check out the latest events before visiting. As well as a tour, you could see a famous singer in concert or a live Gladiator battle. Visit the Verona Arena or the Pompeii Amphitheater in Italy. This arena looks better than the Colosseum in Rome. I would love to visit and watch a live gladiator fight during the Summer months. A Tom Jones concert in the arena would be something pretty special too! I have only been to the Colosseum in Rome and what I find so fascinating seeing these arenas is how we like to romanticize the whole gladiator business today – thanks to Russell Crowe no less 😉 I wonder how spooky it would be to see such a show reenacting this today. Mind you, I think seeing a concert at the Pula Arena would be stunning – what a backdrop! I’ve never heard of the arena in Pula, even though I was there a few years ago! It’s a stunning building, and I’d never thought there would be gladiator fights there. I don’t know why but I never associate it with Croatia. It’s pretty impressive too despite being Croatia’s oldest monument. Very cool indeed! Pula Arena looks just as impressive than Colosseum – I’m imagining the Colosseum but without all the tourists! I can’t think of anything more out of this world than watching a live Gladiator fight during the summer months. Also you mentioned concerts and Tom Jones – I’m a huge fan of his and I couldn’t think of a more unique place to watch his concert than in a Roman Amphitheater! These artists must love performing in Pula Arena too. It’s also very interesting where the word Arena originated from! Pula Arena looks so similar to the Colosseum in Rome. I like the idea of visiting an arena which is not over run with tourists and selfie sticks! The underground is the place I’d like to check out – so much history down there! Pula Arena in Croatia is really beautiful but the what was going on in there must have been less beautiful! And afterwardthey put the killed and injured animals and gladiators in display in that tunnel?! I belive in ghost and the ghost there must be very scary! And I wonder thought why would they spray perfume water on the audience? I have to look it up! Wow Didn’t know Croatia has its dose of arenas too. I am reminded of my walk through the ones in Rome. Yes just like you mentioned, imagined the beasts being pulled through the tunnels. This one seems to be a well maintained arena. I had no idea that “Arena” meant “sand” in Latin! I took Latin in high school, but I only remember a few phrases. This reminds me of visiting the Roman Colosseum, except that the Pula Arena still has major concerts! I would love to check out Elton John in such a historical venue. 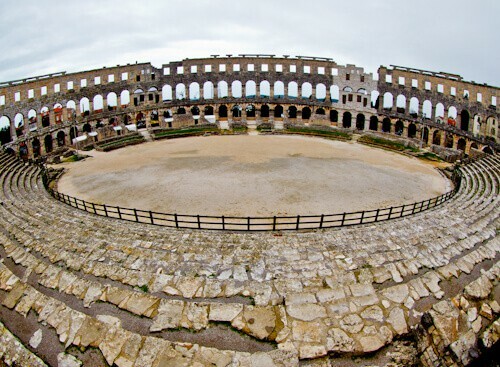 I have seen Colosseum and Greek amphitheater in Athens but this Pula Arena in Croatia looks grand and majestic. I would love to watch live music and Gladiator battle both. The views of Adriatic Sea is enchanting from the arches. Underground tunnels looks scary but interesting. I feel like Croatia has been belittled to a beach vacation with beautiful waterfalls, which makes me upset. 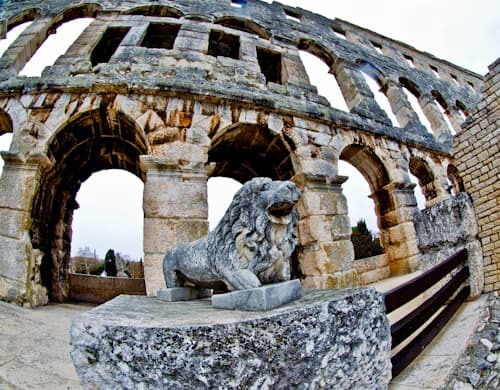 I love history and culture, so I love that you are writing about Pula. Roman history is so rich and culturally significant for that region. As an architecture aficionado as well this is better preserved in some ways than the Colesseum. Definitely, love the snapshots you included of the arena and the inner depths of the amphitheater. 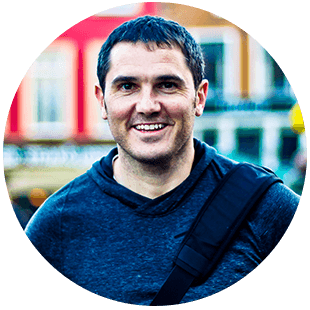 Thanks for writing about Pula!